Jim Wilkes prepares to play the 1926 Casavant as MaryAnn Balduf and Bob Davey offer advice. Terry Jankowski presents his musical offering on the 1926 Casavant. the First United Methodist Church in Jackson. The Rev. 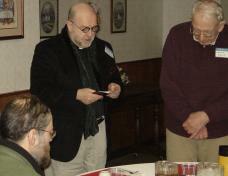 Jasper Pennington, Michigan Chapter Chaplain, says grace at the First United Methodist Church luncheon. Partaking of Coffee and goodies at the Congregational Church. 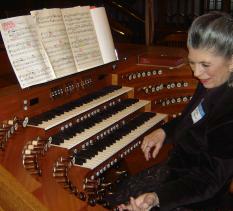 MaryAnn Balduf checks the stops on the Martin Ott organ at the First United Methodist Church. 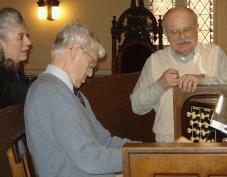 Bob Davey, meeting host at the Congregational Church, demonstrates the Casavant. 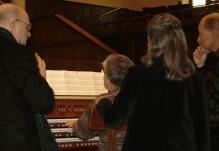 The February 2006 meeting of the Michigan Chapter of the Organ Historical Society was called to order at 10:20 a.m. at the First United Methodist Church in Jackson, Michigan. Present were Carl Balduf, MaryAnn Balduf, Brian Buehler, Robert Davey, Gary Dodd, Trevor Dodd, Leonard Feerick, Dana Hull, Terry Jankowski, Jasper Pennington, Brian Sweetman and James Wilkes. Following an invocation by Chapter Chaplain Fr. Jasper Pennington, Acting President Carl Balduf asked for approval of the minutes as printed on the Michigan Chapter Web site and provided as printed copies at the meeting. Following a brief discussion, at which Fr. Pennington suggested that his "studying with Marilyn Mason" was significantly overstated, a motion to approve the minutes was made and seconded and the motion carried. Terry Jankowski then presented the Treasurer's report, stating that the current bank balance was $1,577.13. A motion was made and seconded to approve the treasurer's report. The motion carried. Old Business concluded, after discussion, with a motion to accept the Madonna University offer to archive the Michigan Chapter materials. New Business included a request by Terry Jankowski that the Michigan Chapter underwrite an upcoming organ recital by member Dave Wagner at the Immaculate Heart of Mary Motherhouse Chapel in Monroe, Michigan on May 7 at 2:30 p.m. After discussion a motion was made and seconded that $500 be approved for that purpose. The motion carried. With a hearty round of applause, the group expressed its gratitude to Brian Buehler and Robert Davey for their hospitality in arranging our day at the First United Methodist Church and the First Congregational Church. Guests for the day included Judy Andrews, Jean Kubish and Peg Eaton, all members of the First Congregational Church, and Dallas Hull, son of Dana Hull. 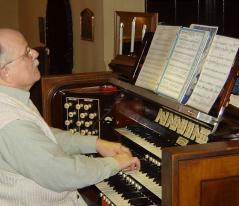 The meeting was adjourned at 10:35 a.m., followed by demonstrations of the Martin Ott organ (Listen) at the First United Methodist Church and the Casavant organ (Listen) at the Congregational Church. Dana Hull tries out the Martin Ott as Fr. Balduf and Leonard Feerick provide backup. 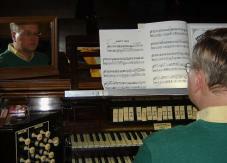 Top right: Gary Dodd prepares to examine the upper works of the Martin Ott organ. Bottom right: Carl Balduf shares a laugh during the meeting. The current checking account balance, not including dues collected on February 18, is $1,577.13.